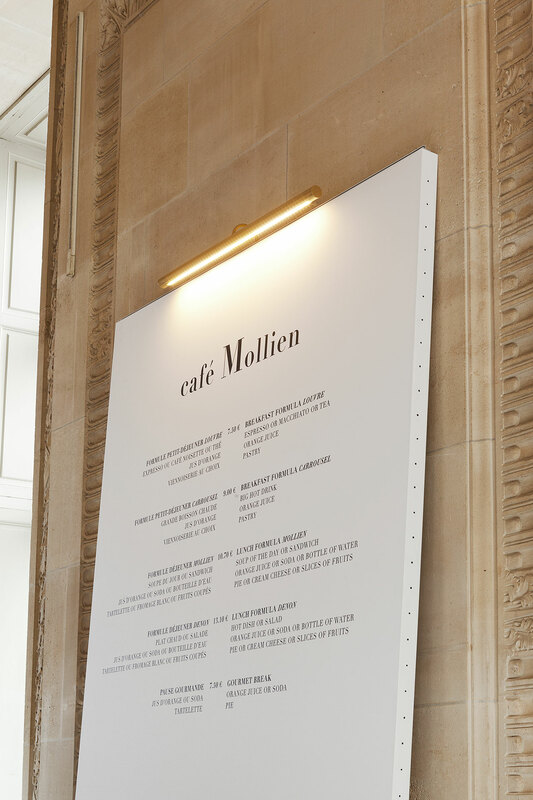 Located on the first floor landing of the Escalier Mollien, a monumental staircase of marble and bronze at the Louvre Museum in Paris, Café Mollien has been refurbished by French designer Mathieu Lehanneur who has added contrasting elements that both defy and supplement the grandeur of the historic interiors. 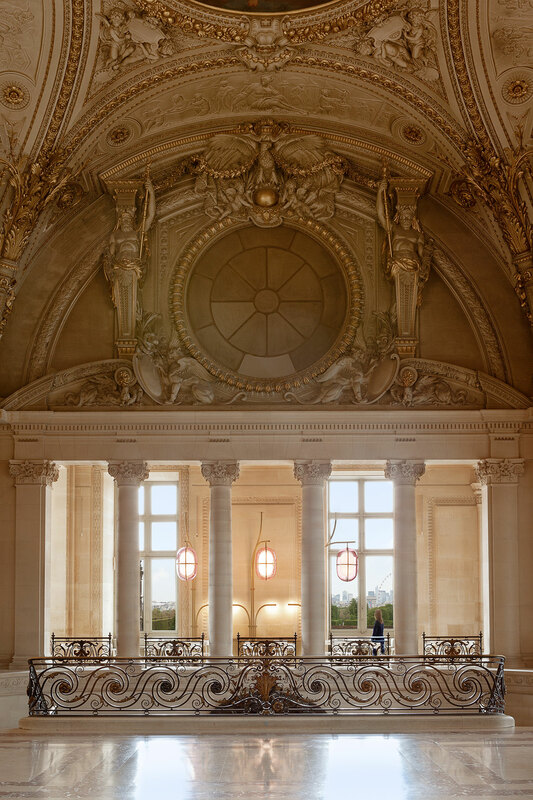 Adjoining the gallery that houses works such as Eugène Delacroix’s “Liberty leading the people” and Théodore Géricault’s “The raft of Medusa”, and surrounded by a decorative cornucopia that includes imposing Corinthian columns, vertiginous ceilings with ornately carved caryatids and atlantes, and La Nymphe de Fontainebleau, a four by two metre bronze sculpture by 16th century Italian artist Benvenuto Cellini, the 150 square metre L-shape space is surrounded by a magnificence of extraordinary proportions. 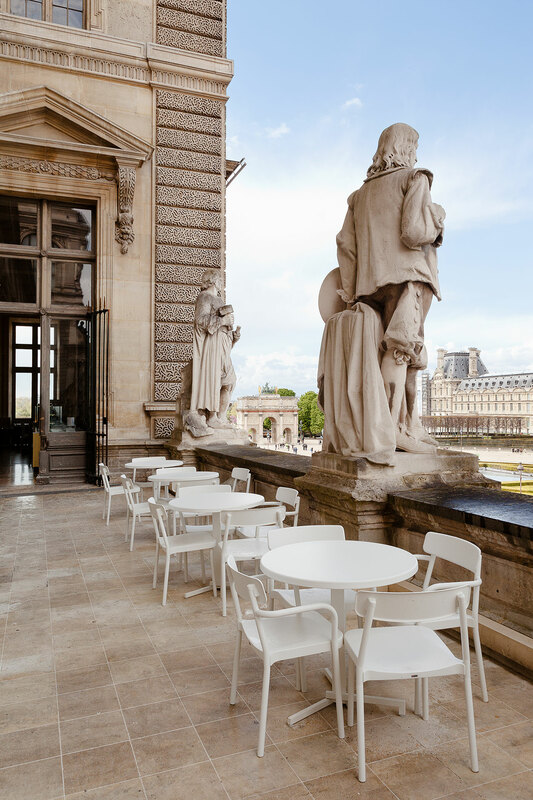 Add the impressive views of I. M. Pei’s glass pyramid -which patrons can further enjoy on the café’s spacious terrace- and the Tuileries Gardens in the distance, and you get a space that defies intervention. Lehanneur’s answer? 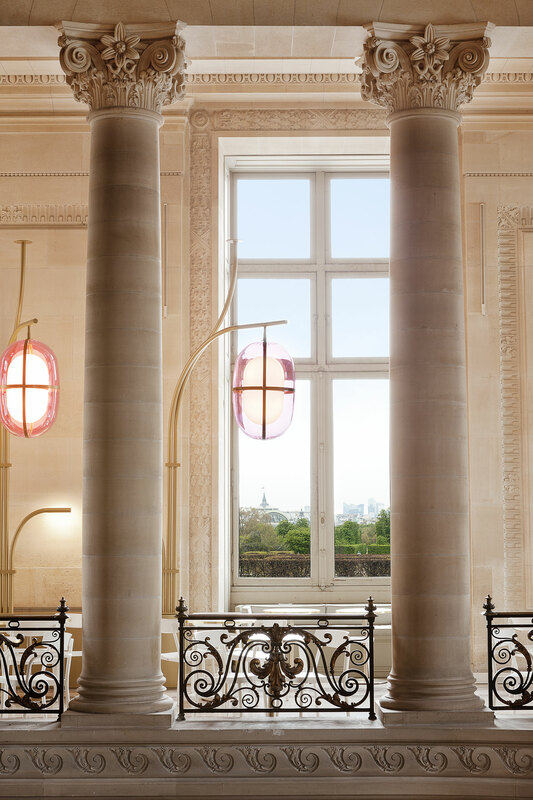 To design a statement of his own in the form of a lighting sculpture of grand proportions. 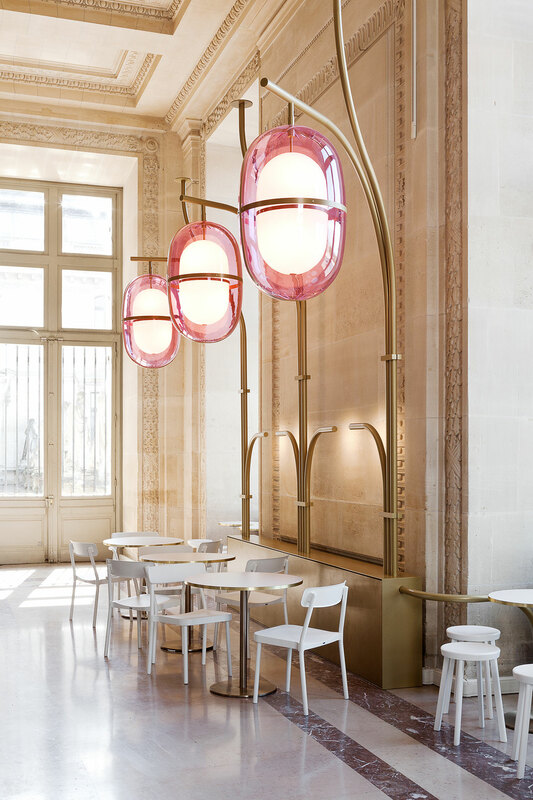 The structure itself features tubular branches of brushed-brass that stretch up to 4.5 metres in height, and from which hang, as the designer eloquently says, “three, large pale-pink eggs; luminous and translucent, floating in space and inhabiting the void that separates us from the ceiling, and act as a signal in the Parisian perspective”. The piece, centred on the staircase’s main axis for maximum visibility, bravely takes on the grand scale and rich ornamentation of its surroundings without however kowtowing to their Beaux-Arts aesthetic, choosing a sleeker, Art Deco-inspired style instead. Similarly iconoclastic, the designer has opted for stark white tables and chairs that pop out amidst the earthy hues of the interiors. 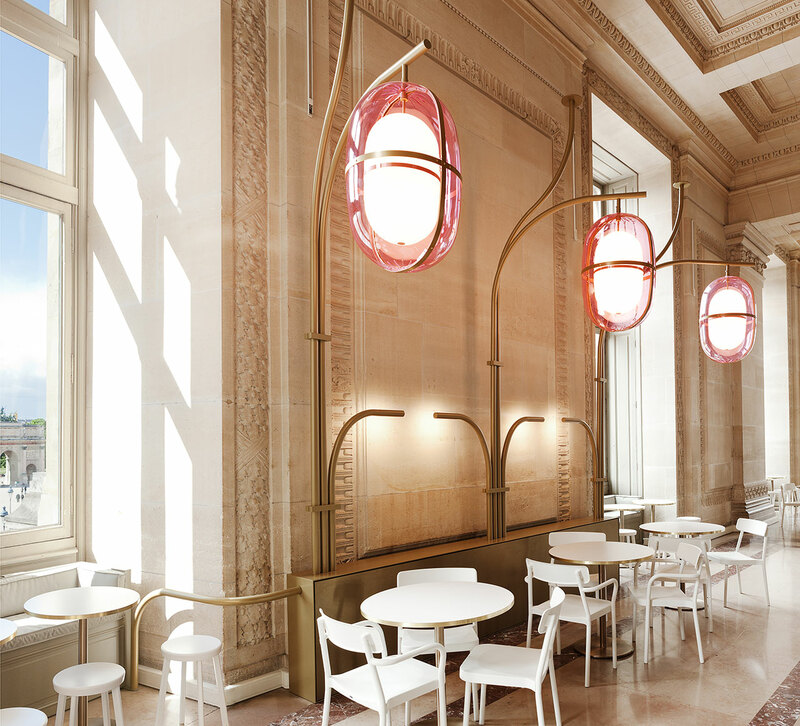 The furniture’s whiteness is further echoed in the 10 metre marble bar at the entrance while the brass detailing on the tables reflect the lighting structure. 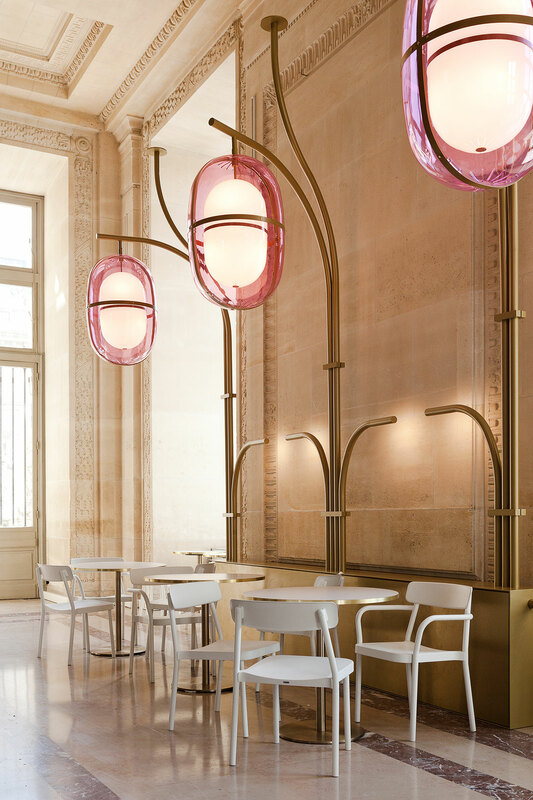 The designer has opted for stark white tables and chairs that pop out amidst the earthy hues of the interiors.